"Including work by literary heavy-hitters... the anthology considers the act and weight of watching and being watched... and in Watchlist, these see-to-know quests range from funny to terrifying." ―Los Angeles Magazine In Watchlist, some of today's most prominent and promising fiction writers from around the globe respond to, meditate on, and mine for inspiration the surveillance culture in which we live. With contributions from Etgar Keret, T.C. 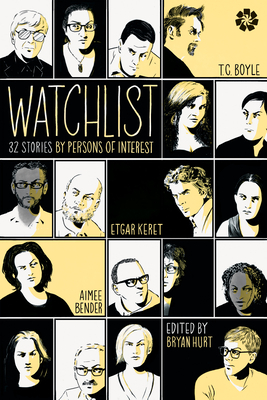 Boyle, Robert Coover, Aimee Bender, Jim Shepard, Alissa Nutting, Charles Yu, Cory Doctorow, and many more, WATCHLIST unforgettably confronts the question: What does it mean to be watched? In Doctorow's eerily plausible "Scroogled," the US has outsourced border control to Google, on the basis that they Do Search Right. In Lincoln Michel's "Our New Neighborhood," a planned suburban community's 'Neighborhood Watch' program becomes an obsessive nightmare. Jim Shepard's haunting "Safety Tips for Living Alone" imagines the lives of the men involved in the US government's fatal attempt to build the three Texas Tower radar facilities in the Atlantic Ocean during the Cold War. Randa Jarrar's "Testimony of Malik, Israeli agent #287690" is "a sweet and deftly handled story of xenophobia and paranoia, reminding us that such things aren't limited to the West" (Sabotage Reviews) and Alissa Nutting's "The Transparency Project" is a creative, speculative exploration of the future of long-term medical observation. By turns political, apolitical, cautionary, and surreal, these stories reflect on what it's like to live in the surveillance state. Bryan Hurt is author of Everyone Wants to Be Ambassador to France (Starcherone Books, September 2015), winner of the Starcherone Prize for Innovative Fiction. His stories and essays have been published in The American Reader, Guernica, The Kenyon Review Online, the Los Angeles Review of Books, Tin House, TriQuarterly, and many others. He teaches creative writing at St. Lawrence University in upstate New York.